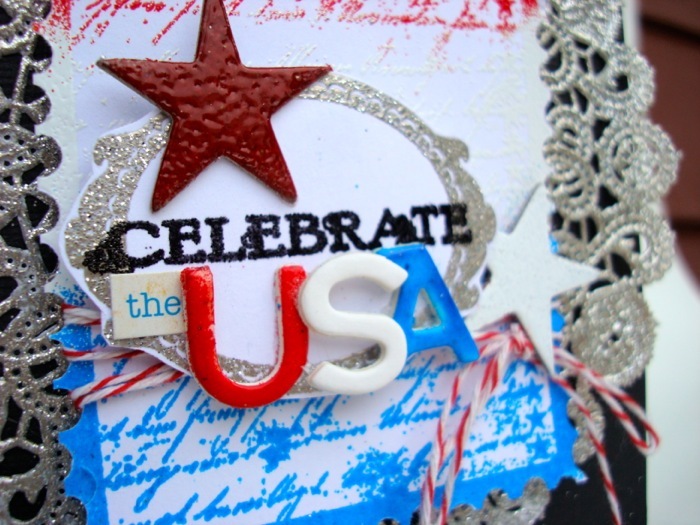 Art Talk: Happy Birthday America! It's the Good Ol' USA's birthday today! In celebration of this great day, I thought I'd share a card that I made with WOW Embossing powders. It's on the WOW blog today with a bit more info about how I made it. I'm being lazy this morning and getting some much needed computer work done (hence the blog posting). I already made Red, White, and Blue pancakes for the family (well, they were kind of mixed a bit too much to make swirls of purple, blue and a tiny bit of red... sigh. The kids loved them anyways) and plan to get a few pieces of art done that I started since hubby has the day off. He's golfing later so I thought I'd take the kids to one of our most American traditions... Baseball! There's a minor league game tonight here with fireworks afterwards so I think we'll head out there and enjoy some American pastime. Hope they take good naps today because it will be a late night! I LOVE fireworks. We went to Lakeshore Country Club's annual fireworks display last Sunday and I have to say that I was really disappointed. They were short, spread out and right on top of us! We sat way too close and ash was raining down on us. The kids were over tired and I was cranky due to that! Not as fun as in the past. I hope tonight is better and the kids behave for me. I'm going to be a single parent out tonight so unless I can convince a friend or my parents to come along, I will be running back and forth to the bathrooms with both kids in tow... I dread that! BUT I want them to go to a game and what better night than on the 4th of July?! 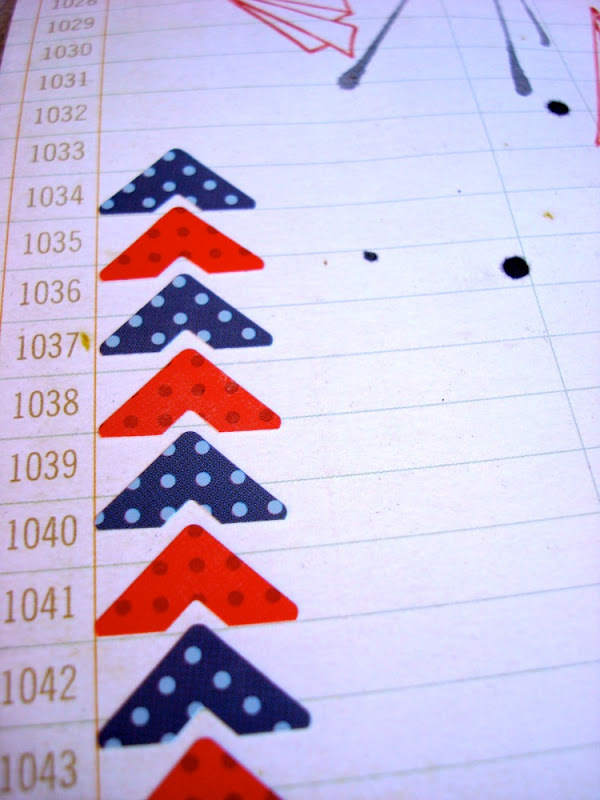 Another Red, White, and Blue page.... see a trend here? LOL! "Rebel Yell" is a page all about my son when he was 2 or younger. he would yell all the time! 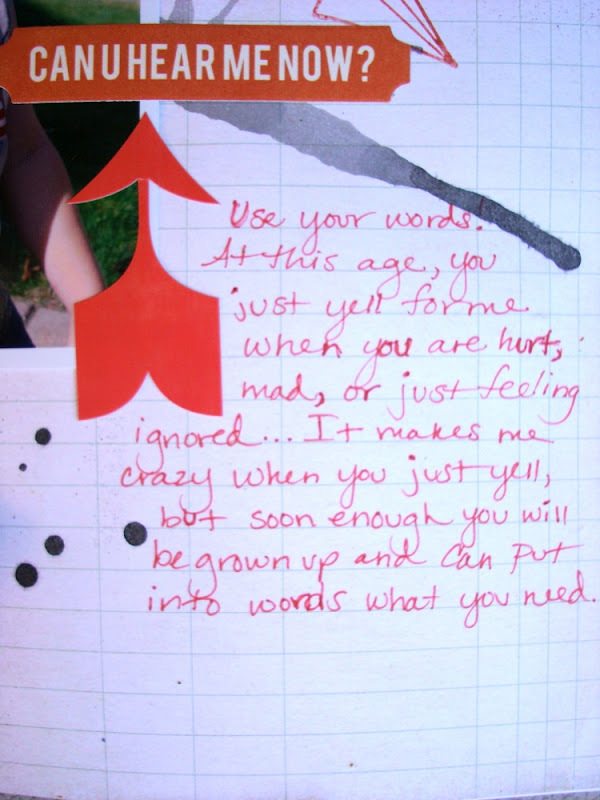 We couldn't wait until he could tell us in a complete sentence what he wanted or what was wrong. I love this photo of him. He looks like a little rebel. I used a straw to blow some watered down Gelato around my page. It created these fireworks of deep blue. I loved the movement I saw in that simple technique. 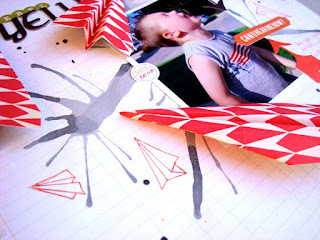 I added stamped paper airplanes (using the Lawn Fawn stamp set and Distress marker in the kit!) all around them. 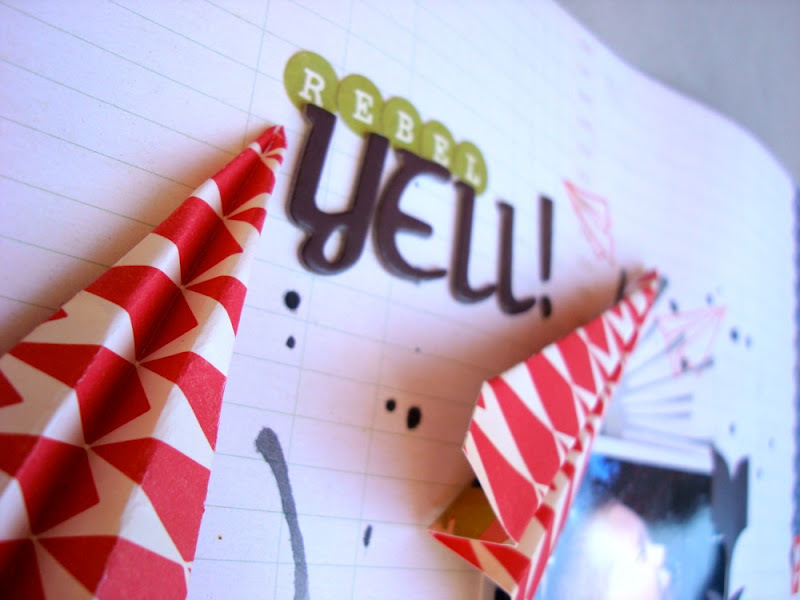 Yep, I folded paper airplanes from one of the kit papers (October Afternoon). I made three dart planes from various sized pieces. I never know what to do with those corner stickers. 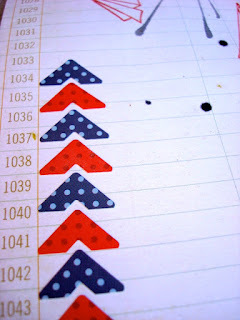 I love them but they never look right on my photos so I created a chevron of sorts here with them alternating. 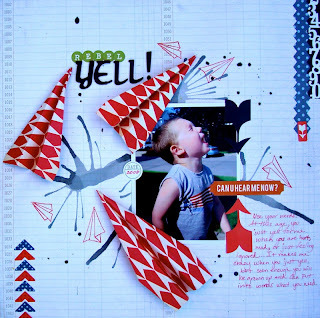 My journaling tells of my frustration with my son's yelling and lack of quiet telling of his needs. He has long since been yacking up a storm and telling me a bit more than I need to know! LOL! 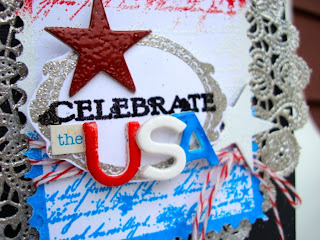 I'll be back this week with some sneak peeks of brand new Prima products for CHA!! 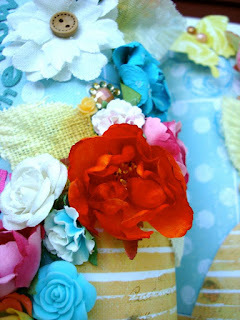 I'm creating lots of fun things with flowers, papers, and embellies that will make you drool! They are awesome!!! 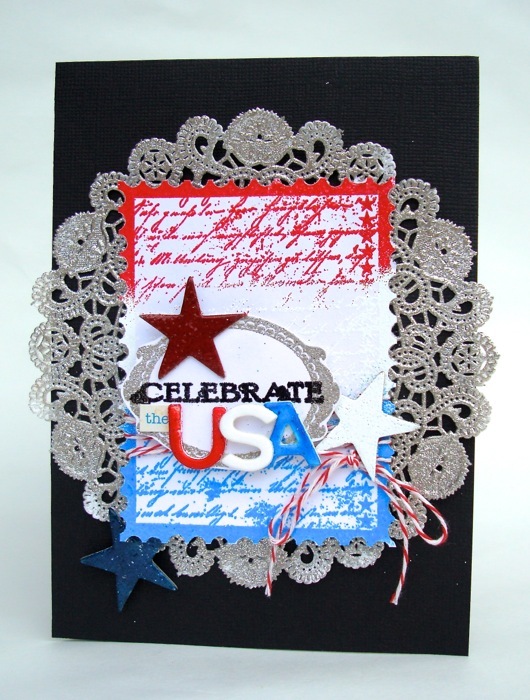 Have a happy 4th everyone!! !